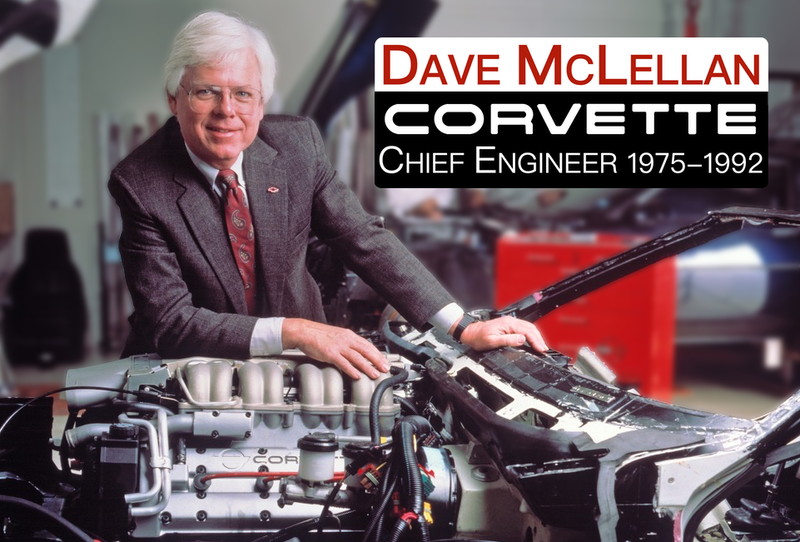 Dave McLellan, retired Corvette Chief Engineer and author of a book on the Corvette, is setting up a web site in order to start a podcast about Corvette. He expects the site and the first podcast episodes to be on line for a February 1st, 2008 launch. With his almost two decade experience as Corvette Chief Engineer and then Engineering Director and his time spent with his predecessor Zora Arkus-Duntov he has a myriad of stories to tell that will be of interest to a Corvette audience. Some of these stories he told in his book, “Corvette From the Inside” but many of them will be new. Dave will also discuss the newest Corvettes and their performance variants. He also plans to draw on Corvette engineers past and present, letting them tell about their contributions to this legendary brand. This entry was posted in Blog and tagged author, Blog, chief, corvette, corvettechief, dave, dave+mclellan, engineer, mclellan, podcast by dhubcap. Bookmark the permalink. Looking forward to the site kick-off! Congrats on the new site. Can’t wait to read your blog. Rock On Dave! Good luck with the new gig on the Net! Col.
We will all look forward to your insights and perspectives. Keep the revs up! Looking forward to reading your blogs! knowledge with us on the Net! Great idea! Good luck with it. Looking forward to future visits. We will look most forward to your podcasts. What a nice idea and thing to do for the Corvette community. We are sure they will be well received and attended by many Corvette enthusiasts. Always love to hear those Corvette stories! This is great news and we look forward to your insight and discussion of corvette history. Read about this in the March ’08 issue of Vette magazine. Really looking forward to this. I really enjoyed your book. Thanks for sharing your knowledge and insights with this community. This is great news. I have read your books, I have spoken to you at many functions, this will be fun. What a great idea! I look forward to learning more from you and your contemporaries. Each time I tell someone about the signature on my ZR-1 motor, an unexplainable smile must come to your face. Thanks for all you have done for the car’s community and good luck with your podcast. We’ll be watching. I’m really looking forward to hearing your thoughts. Your picture with the Corvette engine and what appears to be a schematic of a musical instrument keyboard in the background portend well for how interesting it’s going to be. Cliff Ravenscraft here from BitCast Media. We’re about 90% complete with the design of the website, getting it ready for Dave’s February 1st launch. In talking with Dave, I can assure you that the podcast will be quite interesting. However, in all my conversations with him, Dave hasn’t mentioned anything about music to me. I figured folks might pick up on the incorrect image in the background. This will make for a good “history/trivia” topic for CorvetteChief.com when Dave celebrates his 1st full year in podcasting in February, 2009. I always admired the courage of the people involved with the ZR-1 project. as, the Brittish say, “from the horse’s mouth. Good luck and maybe later I’ll tell you how I bought two of your babies (ZR-1) in Lebanon. This is a very nice thing for you to do for the Corvette Community. I look forward to your site. Thanks for all that you have done for Corvette. This is a wonderful idea. Much success and it is really a much needed site for corvette history lovers. What an honor & a great resourse it will be to have your knowledge on tap for questioning and information. Looking forward to the February kick off. With a lot of work, I got my low mile ’85 in 1990 and in 2001, bought my all time dream car, the ZR-1. This is surely a longer comment than this site is looking for, but all I can think of at the moment to say is “Thank you Dave”. I look forward to meeting you someday. As for a mid-engined Corvette, I think that if the increased performance trend continues at the rate it has been, even with tighter CAFE standards on the horizon, then a mid-engined car and even 4 wheel drive will be the focus of more attention by the Corvette team – especially in getting that increased power to the pavement. I would leave a comment but my tears of joy has shorted out mt key board. CorvetteeChief.com is magnificent. It is wonderful to hear your voice and enjoy the GREAT Corvette stories again. I will be listening to you on Zora’s radio show on Sunday. There is Life after 180 mph!